Our AGM takes place on Friday night next, 5th December at 8:00pm in Scoil Mhuire, Abbeyside. All are invited to attend. This week’s history slot features club officers, hurling and football captains and vice captains and selectors elected at the AGM held in the Sexton Street Club on 16th January 1938. The club decided to affiliate in Junior Hurling and Junior Football. Our ever popular Jack the Joker fundraiser continues this Sunday night in Alice O’Connor’s Bar where the jackpot is €2450. On Sunday night last Margaret O’Brien was drawn out and chose card number 22 which wasn’t the Joker although she did win €50. James, Jack and Joey and Margaret O’Brien won €25 each. As well as our group of ticket sellers tickets can be purchased from Convenience Store Ballinroad, Village Flowers, Spar, Mike Kiely’s Butchers, Mousies Takeaway, Minnies Bar and Crottys Corner Bar. Our Annual General Meeting will take place on Friday 5th December in Scoil Mhuire, Abbeyside at 8pm. Our Club Bingo will continue this Sunday night in the CBS Hall where the jackpot is €1,850. On Saturday last Australia defeated Ireland in the once off Test in Perth, but prior to the match an exhibition Gaelic Football match took place comprising players form Western Australian GAA Clubs. Taking part in the exhibition match was Eoin Brackett who is living in Perth for a few years now and indeed earlier in the year Eoin and Daryl Ryan were members of the Shamrocks team that won the Western Australia Hurling title, showing that both have lost none of the skills which saw them win numerous County Titles with us before departing for Australia. We believe that the Abbeyside contingent in Perth grew even more over the weekend with the arrival of a few tourists who no doubt enjoyed the Perth nightlife with great gusto!! We would like to congratulate Cappoquin on their fantastic victory last Saturday in the Munster Intermediate Hurling Final and to wish both The Nire and Modeligo the very best of luck ahead of their Munster Final matches this weekend. On behalf of all in the club we would like to extend our deepest sympathies to the family and friends of the late Johnny Enright who passed away recently. For generations now the Enright family have given great service and commitment to our club and this continues on the playing fields to this day. Once again we send our sympathies to all the Enright family on their sad loss. Indoor hurling for the juveniles continues this Friday night, 28th November at the Friary College. The under 5 and 6 age group will run from 6 to 6:45 and the under 7 age group from 7 to 7:45. Any newcomers who have not played before are more than encouraged to come along on the night where a certain amount of helmets will be available. Hurleys will be available on the night. To try help cover costs there will be a €2 charge on the night. The Juvenile AGM takes place this Thursday night, 27th November at the GAA club grounds. All parents are encouraged to attend. The AGM of the camogie club will take place on Monday, 12th January at 8.00pm in the club house. The position of secretary has become available. Anyone interested in becoming secretary is asked to contact Emer on 0863288951 on or before the 1st January 2015. Our Annual Christmas party will take place on Sunday, 14th December from 4.00 to 6.00pm in Minnies. Hoping to see all our girls and their families on the day. A fun filled evening is guaranteed with a few special guests. The officers and committee would like to offer their sympathy to our secretary Emer Enright and family on the recent passing of her uncle Johnny. L to R: Jimmy O'Leary, Pa McGovern, Tony Mansfield, Mattie Kiely. 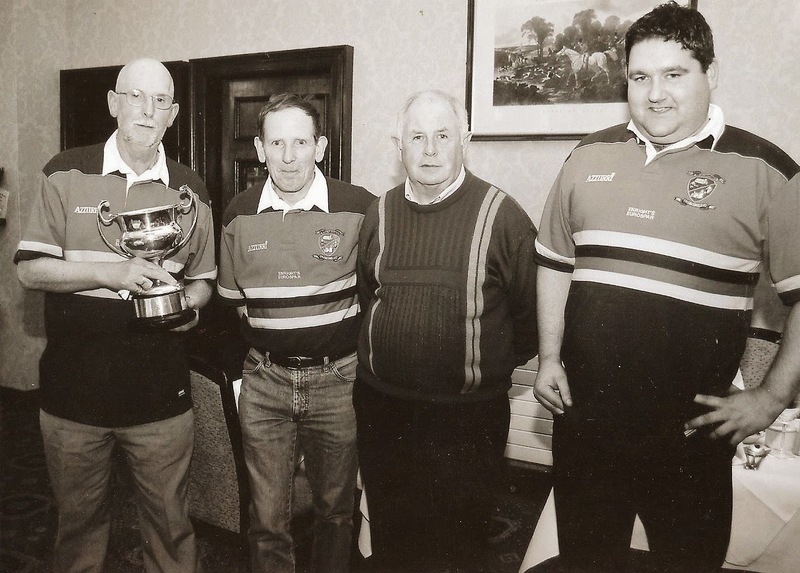 This week's photos shows club members Jimmy O'Leary, Pa McGovern, Tony Mansfield (Chairman) and Mattie Kiely at the post match celebrations following Ballinacourty's 1-10 to 0-6 victory over De La Salle in the 2007 U21 County Football Championship Final played at Fraher Field. Our ever popular Jack the Joker fundraiser continues this Sunday night in Alice O’Connor’s Bar where the jackpot is €2300. On Sunday night last Martina Power was drawn out and chose card number 30 which wasn’t the Joker although she did win €50. Jimmy O’Leary and Ferghal Fraher won €25 each. As well as our group of ticket sellers tickets can be purchased from Convenience Store Ballinroad, Village Flowers, Spar, Mike Kiely’s Butchers, Mousies Takeaway, Minnies Bar and Crottys Corner Bar. On behalf of all in the club we would like to congratulate Shane Briggs on being nominated for the Footballer of the Year award last weekend. This is a great recognition for Shane and we wish him the best of luck ahead of the Awards function in December. On Friday last Ray Burke finished up as member of the maintenance scheme in our club grounds. We would like to sincerely thank Ray for all the hard work he put into the grounds during his time with us, which helped keep the grounds in such excellent condition. Our Club Bingo will continue this Sunday night in the CBS Hall where the jackpot is €1,800. We would like to congratulate both The Nire and Modeligo on their wins in the Munster Club Championship on Sunday last and also to wish Cappoquin the very best of luck ahead of their Munster Club Final in Mallow this Sunday. Indoor hurling for the juveniles continues this Friday night the 21st November at the Friary College. The under 5 and 6 age group will run from 6 to 6:45 and the under 7 age group from 7 to 7:45. Any newcomers who have not played before are more than encouraged to come along on the night where a certain amount of helmets will be available. Hurleys will be available on the night. To try help cover costs there will be a €2 charge on the night. The juvenile AGM takes place on Thursday night the 27th November at the club grounds. All parents are encouraged to attend. 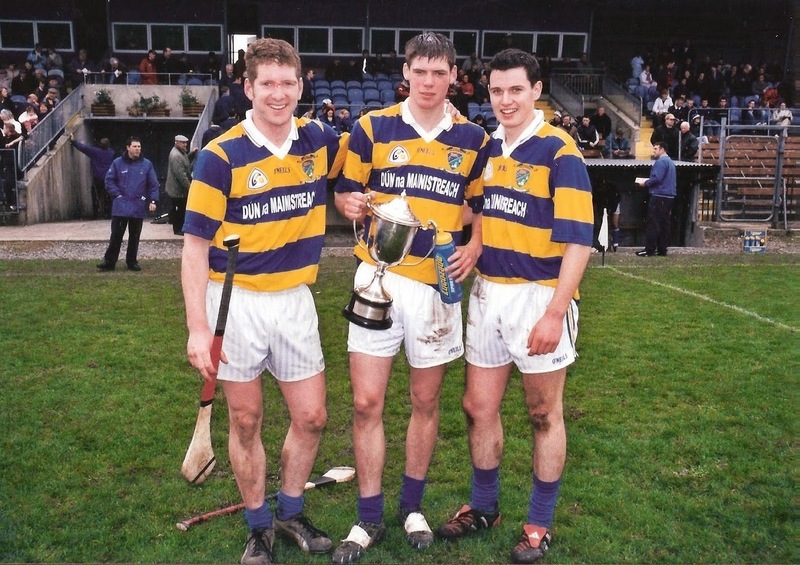 This week's photo comes from a decade ago and shows the Hurney brothers, John and Patrick, along with John Kindregan celebrating Abbeyside's seven point victory over Ballygunner in the 2004 County U21 'A' Hurling Final Replay at Fraher Field. This win secured the first of three U21 County titles in four years. Our ever popular Jack the Joker fundraiser continues this Sunday night in Alice O’Connor’s Bar where the jackpot is €2150. Jim O'Mahony was drawn out of the drum and picked card 21. He did not turn the Joker, but did win €50. Séamus Fitzgerald and Jimmy Meehan won €25. As well as our group of ticket sellers tickets can be purchased from Convenience Store Ballinroad, Village Flowers, Spar, Mike Kiely’s Butchers, Mousies Takeaway, Minnies Bar and Crottys Corner Bar. Our Monster Bingo went ahead in the Park Hotel on Sunday last and we would like to thank all those who supported it as well as the staff of the hotel for all their help and assistance on the day. This Sunday night the bingo returns to the CBS hall. We would like to wish both The Nire and Brickey Rangers the very best of luck ahead of their Munster Club Football games this Sunday in Fraher Field. We would also like to wish Modeligo the best of luck ahead of their Munster Club Hurling match and finally congratulations to Cappoquin on their victory over Feakle on Sunday last in the Munster Club Intermediate Championship. The County Bórd na nÓg, awards Night 2014 will be held on Friday 28th November at 8:00pm in Cumann Micheal Mac Craith, Trámhór. The following players from the club have been invited in recognition of their Man of the Match displays in county finals this year. U14 Hurling Div 1 – James Riordan, U13 Hurling Div 1 – Michael Kiely, U16 Football Div 1 – Darragh McGrath, U14 Football Div 1 – Shane Kiely, U13 Football Div 1 – Michael Kiely. Well done to all. Indoor hurling for the juveniles will begin this Friday night the 14th November at the Friary College. The under 5 and 6 age group will run from 6 to 6:45 and the under 7 age group from 7 to 7:45. Any newcomers who have not played before are more than encouraged to come along on the night where a certain amount of helmets will be available. Hurleys will be available on the night. To try help cover costs there will be a €2 charge on the night. The Juvenile AGM takes place on Thursday night the 27th November at the GAA club grounds. All parents are encouraged to attend. Well done to the two local schools Scoil Garbháin and Garranbane NS on reaching the finals of the boys and girls national schools Western finals respectively that were played at Dungarvan GAA Club over the weekend. While neither were successful in their quest for victory both played very well on the day and were unlucky in defeat. As always the club would like to thank all the teachers in the parish who give of their time to promote our games in their schools. Our Under 16 footballers wrapped up the year of competitive action for the juvenile club at the Fraher Field on Saturday morning last when they played the Western Final of the Under 16 Football competition. After losing the county final of this competition earlier in the year narrowly these lads were determined to take at least one title from their year’s efforts. They took on the Nire on a very windy day. After being against the wind in the first half they played some outstanding football against the elements and led by two goals at half time. In the second half with the wind the lads pulled away to win well in the end against a gallant Nire outfit. Team captain Patrick Power raised the cup on behalf of a team that really deserved some silverware at the end of a long hard year. Well done to all the players and management involved. Congratulations to our U16 players and management team on their 3-14 to 2-4 victory over the Nire in the Western Football Final played at Fraher Field yesterday. 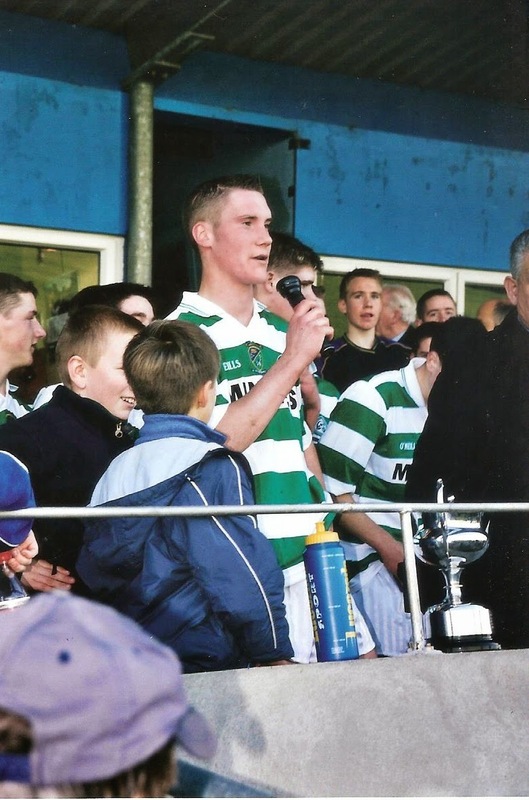 This week's photo comes from November 2003 and shows Patrick Lynch making a speech following victory over De La Salle in the County Minor 'A' Football Final at Fraher Field. Trailing by 2-2 to 1-3 at half time, the Ballinacourty boys put in a storming second half display to win on a scoreline of 2-8 to 2-3. This triumph secured back to back County Minor Football titles, last achieved in 1995. There was great excitement in Minnies Bar on Sunday night last as our Joker Jackpot of €8,800 was won by Declan Hayes who chose card number 10 when pulled out of the drum. The Tobin family and Niamh Briggs won €25 each. This week the draw will move to Alice O’Connor’s Bar where the jackpot is €2000. As well as our group of ticket sellers tickets can be purchased from Convenience Store Ballinroad, Village Flowers, Spar, Mike Kiely’s Butchers, Mousies Takeaway, Minnies Bar and Crottys Corner Bar. On behalf of all in the club we would like to wish James O’Mahony the very best of luck as he heads off to Malaysia for the next twelve months. James has been a member of both our Senior teams for the last number of years. Indeed he made his Senior debut for the club in our 2007 Munster Club Semi Final victory in Killarney as a 17 year old and since then he has given great service to the club. Whilst he will be an undoubted loss to us in 2015 we wish James the very best of luck and hope to see him back in the club colours again in 2016. Our Monster Bingo will take place in The Park Hotel on this Sunday at 3pm with €3,000 in prize money. As always your support would be greatly appreciated here. On behalf of all in the club we would like to congratulate Timmy Organ and Breda Veale on their recent engagement which was revealed to us all at Timmy’s recent surprise party last weekend. All in the club wish them every happiness together in the years ahead. We would like to send our congratulations to all in The Nire on their great win over Ballylanders last Sunday and wish them the very best of luck ahead of their Munster semifinal against Cratloe in two weeks. We would also like to congratulate our near neighbours Brickey Rangers on their return to Senior Football and wish them the best of luck ahead of their game against Ardfert in the Munster Club Championship. The Juvenile AGM takes place on Thursday night, 27th November at the GAA club grounds. L to R: Patrick Hurney, Darrell Ryan, Mark Gorman, John Gorman. 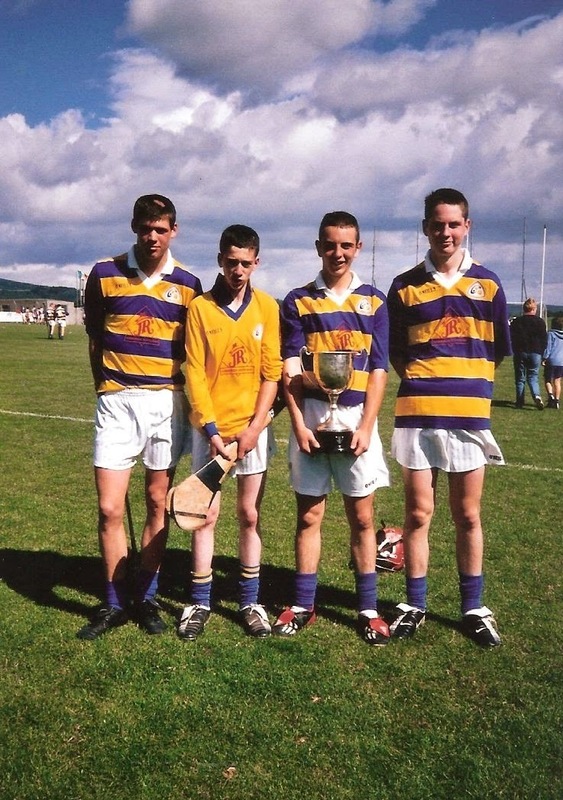 This week's photo comes from September 2002 and shows Patrick Hurney, Darrell Ryan and the Gorman brothers, Mark and John following Abbeyside's 8-11 to 1-6 victory over De La Salle in the U16 County Hurling Final played at Fraher Field. This win bridged an 18 year gap and brought only the third county title to the club at this grade.